(by cutting and pasting) that does extra things that I need. (actually a collection of my buttons) when running an application that uses it. so then if I click on that area the button works but otherwise it does not. remains in the same part of my button. <MyButton>>handleEvent: anEvent> at the top of the stack. But I have gathered little useful information by looking at this stack. and reinstantiate them every time they need to be resized. Is discarding my buttons and reinsantiating them the only solution? can you file-out and share your version of the IconicButton class? Morph >> #handleEvent: is too low-level for your use case. 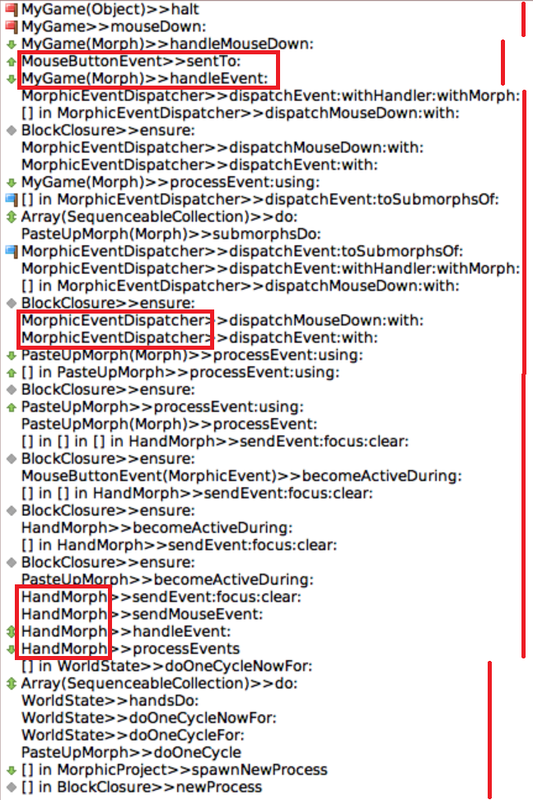 You should only overwrite/implement #handlesMouseDown: and #mouseDown:, for example. button labelGraphic: (MenuIcons homeIcon scaledToSize: 100@100). ...because the button is smaller than its icon. pbutton label: (MenuIcons homeIcon scaledToSize: 100@100) asMorph. >handleEvent: anEvent> at the top of the stack. it was resizing the buttons too but I was wrong. instances it (of course) worked all along. > can you file-out and share your version of the IconicButton class? responsible for changing the button's extent. together and let it be responsible for the changes. avoids my getting the emergency window. I had no idea that #handleEvent is lower level than #mouseDown:. Is there a place that I can learn things like this? Squeak seems to provide little documentation here (as elsewhere). It is definitely a trial by fire for me to figure all this GUI stuff out. I am developing some children's educational software in Squeak. > Seems to me that the icon in your button is bigger than your button. > Only the button/owner gets the events here. YOU WERE RIGHT. This is what I did wrong. > I had no idea that #handleEvent is lower level than #mouseDown:. > Is there a place that I can learn things like this? > Squeak seems to provide little documentation here (as elsewhere). > It is definitely a trial by fire for me to figure all this GUI stuff out. > I am developing some children's educational software in Squeak.